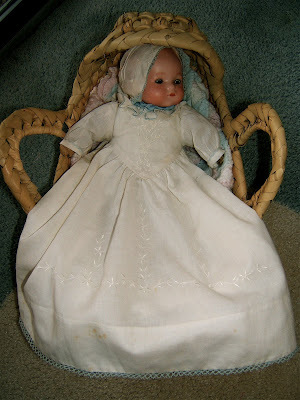 Just before Christmas a friend had shown me a doll that belongs to her mother along with two dresses that were hand-stitched by her just before my friend was born. 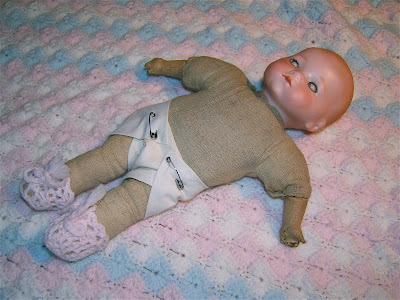 A lifetime ago I dressed and restored old dolls, but not for the last 15 years. My heart melted when I saw these treasures. So I consented to outfit this little beauty. 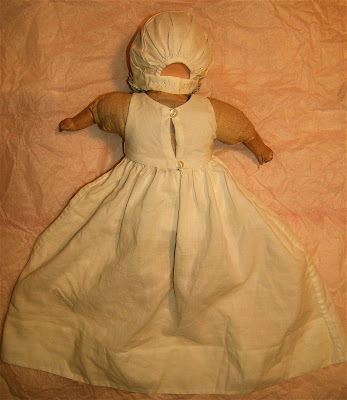 In her later years, my friend's mother crocheted booties and a blanket to wrap this poor naked baby.These cotton batiste dresses are finely hand-sewn and decorated with whitework embroidery, pin-tucks, and scalloped edgings. I drafted some pattern pieces. I wanted to feature the triangle of whitework embroidery in the front bodice of the dolls dress, so that's where I began. I figured out that bodice piece and then the rest of the dress. 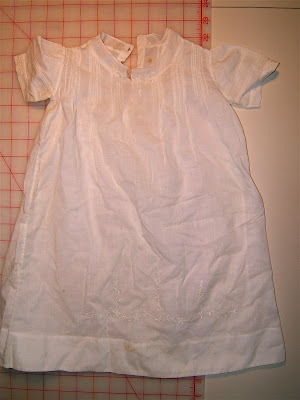 I incorporated much of the original embroidery from each baby dress. 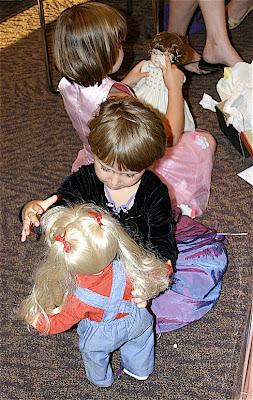 The pieces were laid on the doll to design her dress. At this point I was very excited about this project. 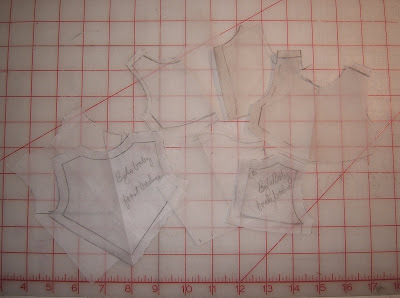 I determined the major pieces for her dress ... the triangle of embroidery for the bodice, the embroidery decorated skirt, and the scallop-edged collar and sleeves. 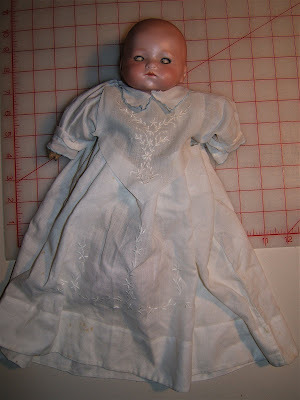 Because the original dresses were hand-sewn, I did the same in making the doll's garments. 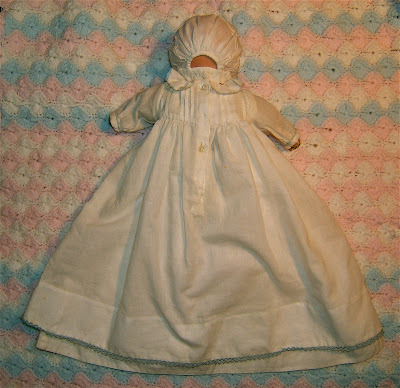 An embroidered and pin-tucked sleeve of a baby dress became her bonnet. The embroidered band from the other sleeve was used as a band for the bottom of the bonnet. I just happened to have blue silk ribbon for its tie. There was also blue tatting in my supplies that I whipped to the rim of the bonnet and hem of the dress. I used the original placket with the hand-made buttonholes and mother of pearl buttons for the closure of the dolls dress. The skirt of the other dress and more pintucking make up the parts of this petticoat. Buttons from one of the dresses and button-hole stitched thread loops are the closure. 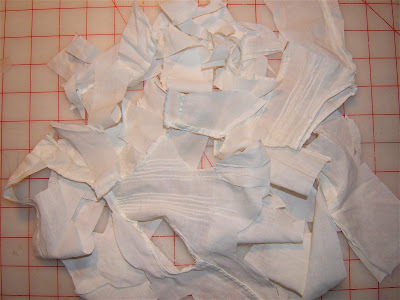 Below are the scraps left from those two dresses. I found a bassinet basket that was stored away with my doll collection stuff. I made a pillow from the scraps and lined the basket with her crocheted blanket. My friend will present this doll to her mother for Valentine's day. 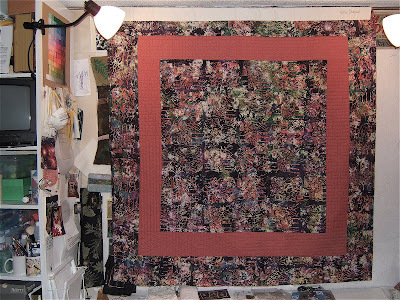 This "ortwork" piece was one of eight quilts that made up the Smoky Mountain Quilt Guild's entry to the 2003 AQS Ultimate Guild Challenge. We won second place. 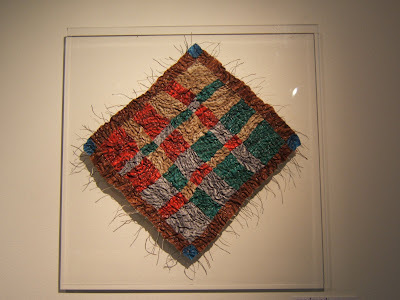 I had made up several large "ortwork" pieces using scraps of fabric and thread. I also added cut apart silk flowers that I had chopped up. I made 6" blocks, then butted them together and connected them with zig-zag stitching. 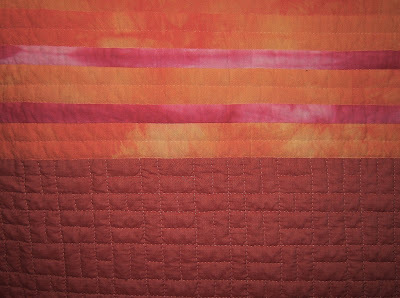 Those seams are reinforced with 1/2" strips of bias fabric hand-sewn over the seams on the back of the quilt. The teapot and mugs are machine appliqued. I used the freezer paper technique. The shapes were drawn on the paper, the wax side ironed to the fabric, the shapes were cut leaving an allowance to fold over and then pressed. The handles are bias tubes of the black and white fabric stuffed with upholstery cording. The raw ends are caught under the shapes, otherwise the they hang loose. 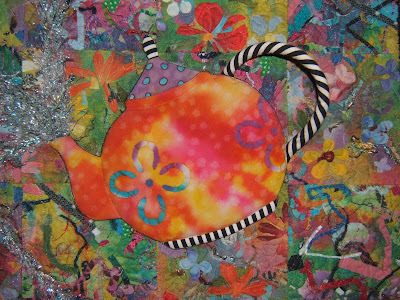 I outlined the teapot and mugs with a permanent fabric marker to define their shapes against the background. The elixir pouring from the teapot into each mug is a long, furry yarn couched in place. It was too subtle, so I painted each furry strand using a variety of glitter glues to make the stream sparkle and seem magical. This piece was a Christmas present to my granddaughter that year and it hangs in her bedroom. 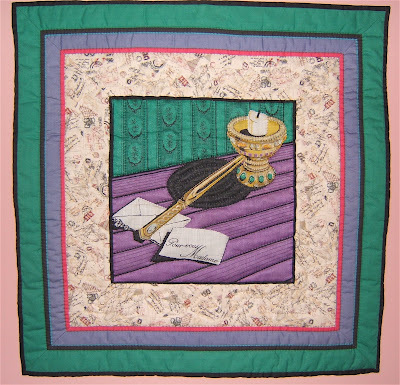 A number of years ago my friend had viewed a traveling exhibit in Milwaukee of quilts made with handkerchiefs. This prompted her to give the book about the exhibition, "Handkerchief Quilts" by Pat Long Gardner, to me along with her own collection. They were souveneirs from her brother who brought them back from AFS trips abroad during the 1950's. I made a wall hanging as a Christmas present for her several years ago with one that came from France. I was so pleased to have the most appropriately printed fabric for the inner border already in my stash. It also happened that there was the striped fabric on my shelves for the outer border that perfectly matched the colors in the handkerchief as well. It is hand-quilted. 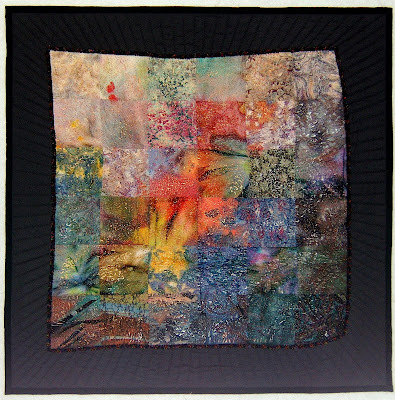 Recently I made this piece using her hanky that had come from Germany. 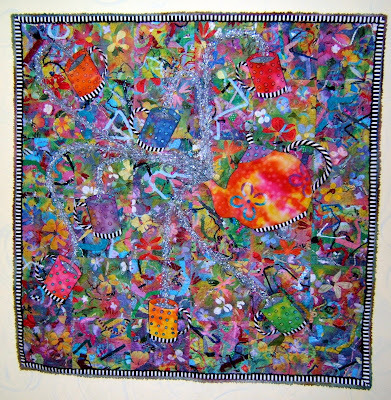 The border is a silk crepe scarf belonging to a lady who is one-hundred years old. I combined the two in this piece to honor the wonderful, caring friendship between my friend and her friend, Alice. I wanted to retain the scarf's identity by keeping the original hem finish. To accomplish this I couched a finer orange yarn a 1/2" from the hemmed edge. The seam line on the back gave me a guide as well as a place to blind-stitch hem the backing in place. This left the original edge of the scarf to "flutter" but still stand up on the top of the piece. The scarf border is machine quilted along the zig-zag lines and yarn is couched over the straigt lines. 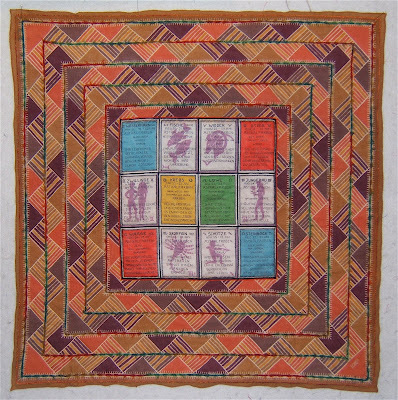 A fine rayon flat cord is couched over the lines between the cards in the handkerchief. 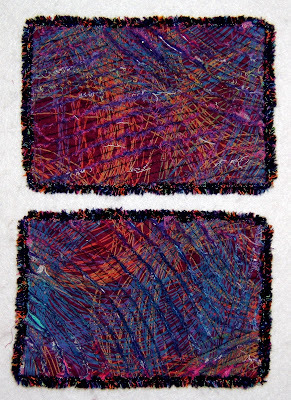 I then zig-zag stitched between two fine lines that were printed around the outside edge of each card. 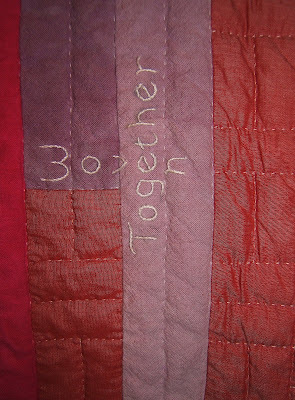 Since I began quilting in 1994 I've made over fifty cuddle quilts . Many were created as gifts (wedding, birth, and graduation) and quite a few for ill children at our Ronald McDonald House. This is the one that I've kept for my personal use. It is made of chambray and hand-dyed muslin fabrics. This is the only fabric I have ever dyed. 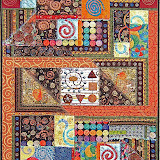 It was an all day affair of great fun with about six other quilters. As those of you have dyed know, you don't really see the results until many, many hours later after the pieces are ironed. I finished ironing mine about midnight of that day. I was exhausted but still too "hyped" to go to bed. I began playing with the selvedges I had trimmed off that were piled on the end of the board. I wove them together in this simple pattern ... and then went to bed. 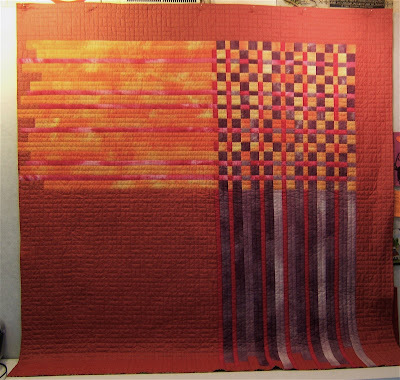 The next morning I got out graph paper and drew up the pattern to make a quilt from that spontaneous weaving. It was easier than it may appear. 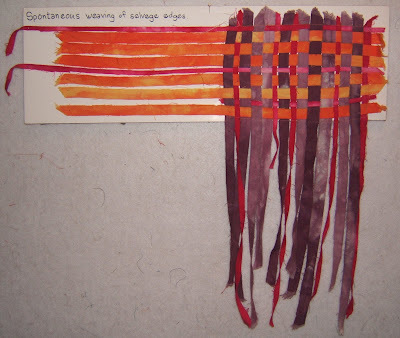 Several rows are the same in weaving, so I strip-pieced quite a bit. A number of the fabrics are mottled so it appears there are more than there really are. 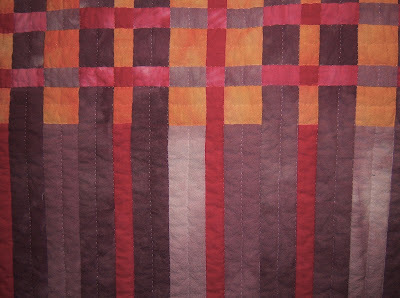 I hand-quilted it with the pattern of lines that I saw in the "woven" area. The embroidered words of the title are woven together. The back is pieced with a batik and the chambray. It has a knife edge finish rather than a binding. I didn't crop this photo thinking some of you may like a peek at the area surrounding my design wall. I have since determined that painting rather than dying fabric is for me. It's less labor intensive and I can see the results a lot faster. I also think painting is less toxic than dying. The labor and toxicity are major considerations because of my fibromyalgia. 1. I'm an Iowa farm girl. Milking three cows by hand was my main chore ... twice a day ... every day ... even when I was going to the University of Iowa. Wonder if I smelled like the farm? There were never any comments if I did. Way back then I declared that I'd never marry a farmer, a preacher, or a teacher. They all have to work too damn hard ... and for little monetary compensation. 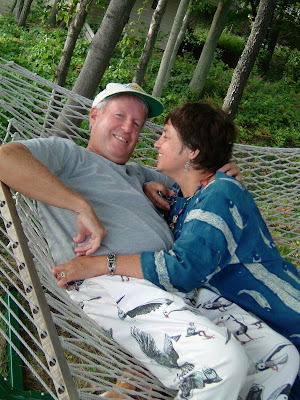 I moved away from the farm to Milwaukee and married an advertising man 43 years ago. He's the love of my life. 2. I have a large doll collection. I loved dolls when I was a child, but didn't have any. A great deal of my childhood was spent in a children's home ... the farm was with foster parents. 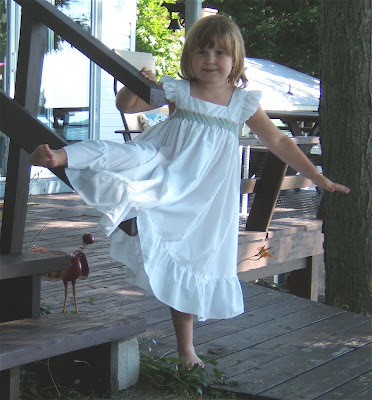 When I was little I used to cut up my socks to make a doll and her clothes. This got me in trouble because I kept "losing my socks". Of course, I had to keep the doll hidden and play with it in secret. 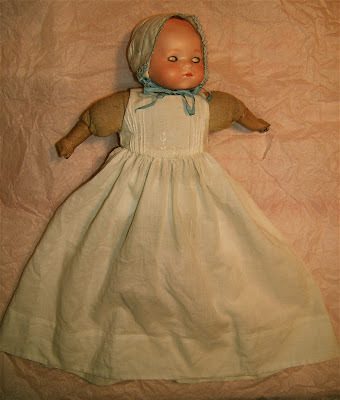 Consequently, I've over-compenstated and have accumulated over a hundred dolls through the years. I got my last doll from Santa at the age of 50. Now there are just a few that I feel attached to. 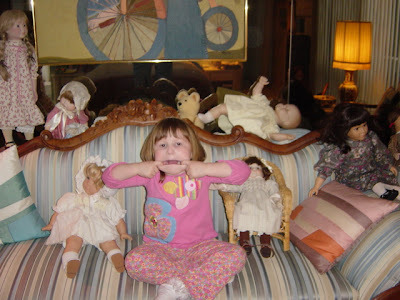 Here's my only granddaughter sitting among some of them. 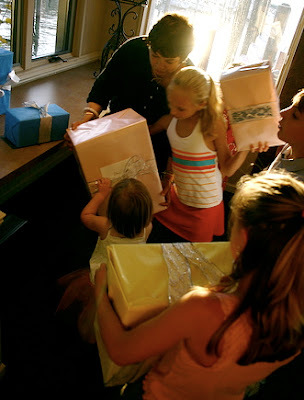 I've been gifting many of them to Tessa, as well as to all the little and big girls in my life. 3. 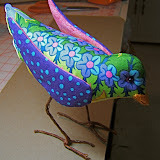 I have always liked sewing and needlework. As a girl I embroidered many dish towels and finger crocheted any and everything. There was a treadle sewing machine on the farm that became mine. 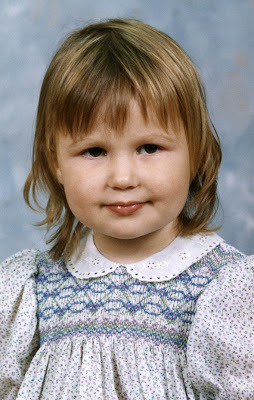 I made clothes for myself and my sister as well as dresses for her doll ( I was too old for one), Through the years I've done a lot of knitting, canvas and crewel work, even making bobbin lace, plus fine hand-sewing and smocking. For many years I taught smocking techniques across the United States and in Canada. Also, I'm a founder of the Smocking Arts Guild of America ,a national organization. I wrote a number of books and designed patterns and kits for smocking as well. 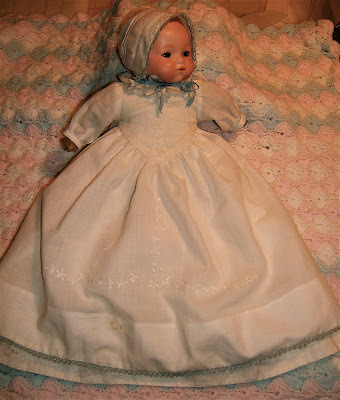 I still smock an occasional dress or doll garment for my Tessa. Plus, she wears the classic style garments I made as class samples many years ago. 4. I love to read and I prefer to read the whole book without interuption. Consequently, I've got to time my escape into books. Interuptions make me cranky ... I want to be "there". I used to have to hide in the outhouse to read on the farm ... there was always something else I was supposed to be doing. I suspect my escapism style of reading began as a child. I especially loved fairy tales. 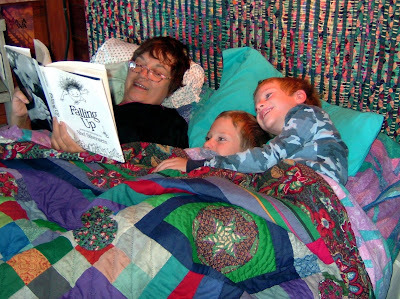 I don't know who enjoys the story more when I read to my grandchildren. 5. I have Fibromyalgia. I can hardly believe it's been for ten and half years now. It has lessened in severity over time. The most difficult thing was learning to pace my activities ... and to give up playing tennis. My body cannot handle repetative motion without going into muscle spasms. Thankfully there are varied activities involved in the process of making quilts. There is cutting fabric, basting, machine sewing, hand-sewing and quilting , plus a lot of sitting and studying the design board ... as well as surfing and blogging on the computer. 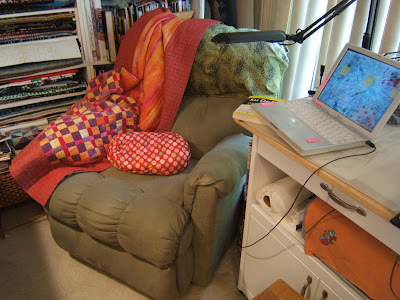 I call this chair my nest. My laptop, cuddle quilt, and pillow are handy and there's a good lamp for doing handwork, reading, or doing a sudoku puzzle. So, I'm tagging: Kay, Karen , Ferret, Dianna and Sharon . But, ladies, if this isn't your "thing", you have my blessing to ignore it! 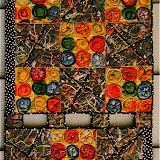 This is the piece that started my journey into making "crinkle quilts". Five years ago we took a wonderful two week cruise along the north and south coasts of New Zealand plus a week in Tahiti to celebrate my 60th birthday. I cannot go anywhere without needlework ... especially a trip that involves long periods of sitting. The prohibition of scissors on airplanes had been invoked just a few months before. I was desperate for a sewing project to take on that trip. Three years earlier I had sewn this top together. I was just playing with blocks that had been cut from every piece of fabric in my stash (it was rather limited at that time). The ones I put together looked like a painting. I knew then that someday I'd figure out a way to make it look like a picture painted with a palette knife. To get that kind of texture I wet it, scrunched it up into a ball, secured it with rubberbands and let it dry. Then it sat balled up in the corner of a storage chest until I needed this project. 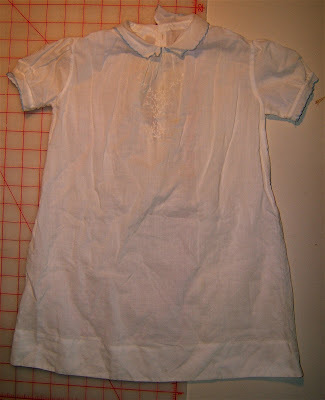 My wrinkled top was layered with batting and a muslin backing then basted together. I determined at this point that a frame would not be required to do the quilting. To solve the ban on scissors problem, I cut 24" lengths of about 100 different colors of 6-ply embroidery floss. I packed a few needles with my basted quilt plus the hank of floss. Put it all into a plastic baggy and I was ready to GO. 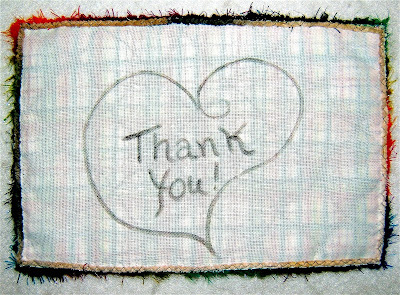 I used 2-ply strands of floss to stitch meandering rows across the piece between the lumps and bumps of the quilt that I held freely in my hands. 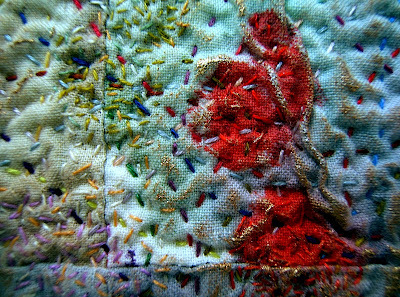 I also added areas of seed stitching with a 1-ply strand to help distribute or emphasize spots of color in the compostition. I stitched on the airplanes, on board the masted ship, in the tropical paradise of Tahiti, as well as in the car driving between Knoxville and Chicago (we flew out of O'Hare). The title came to me while I was stitching on the south seas. I felt the elements of fire, water, air, and earth so strongly in that part of the world. We sailed past an active volcano and walked in long dormant ones. And then of course not only were we on the water, but it seemed to be everywhere ... even when we ventured on land. Land was always visible as we sailed along the coastline ... and it felt so good to stand on firm ground when we went ashore. It seems as though we lived in the open air while on ship ... very little time was spent in our really nice cabin. The wrinkling and stitching gave an irregular shape to the piece that I really liked. 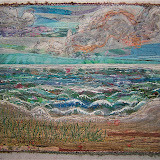 The only way I could figure out to finish this piece was to reverse applique it to a larger piece that I hand quilted. 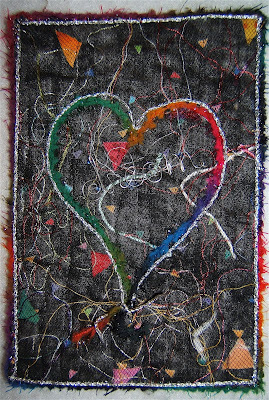 I laid the "crinkle quilt" on the large outer piece then traced around it and drew radiating lines out to the edges with chalk. 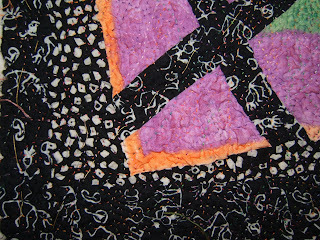 The "crinkle quilt" was machine sewn to the large piece that had the quilted borders. 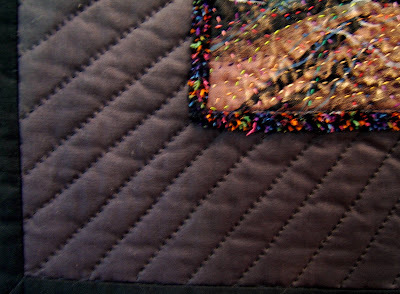 The excess background quilt was trimmed away from behind the "crinkle quilt". The raw edges on the front were finished with couched yarn while those on the backside got bias tubes sewn over them. 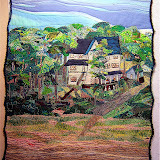 There are many joyful memories as well as the pleasure of stitching in this piece. It is the only "crinkle quilt" that I've kept. It is one of the few quilts that's in the rotation for the one quilt hanging spot in our livingroom. I thoroughly enjoy every step of creating these quilts and can picture myself making them for a long time to come. Since making this first one I've refined the wrinkling and stitching techniques and have mounted them in frames and more recently on plexiglass. 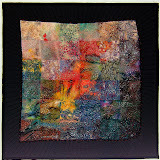 To see all my pieces and read more about the technique click on the label, "crinkle quilts". 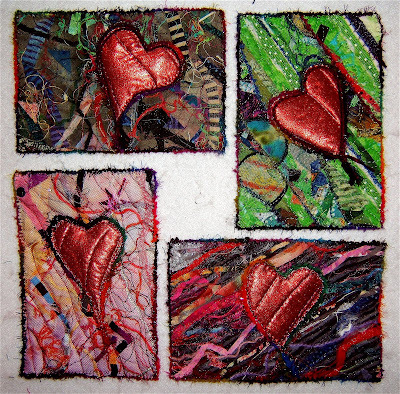 There was just enough of the before-quilted metalic red fabric left to make four hearts. 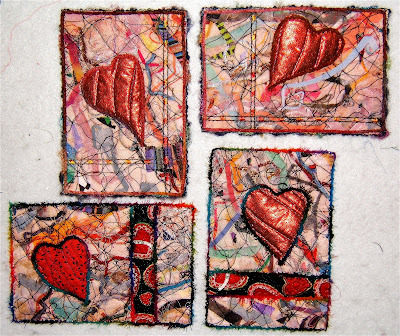 This prompted me to make "just" four more valentine postcards for wounded soldiers. The backgrounds were cut from larger pieces of "ortwork". 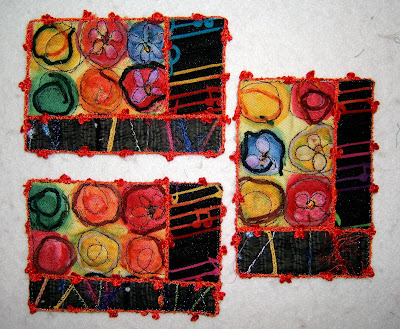 I had collaged these together from fabric and thread scraps quite sometime ago as elements to use in future art pieces. I certainly hadn't thought their complexity would end up representing the fragmented, interrupted lives of the recipients of these cards. This is how the twenty-two valentine postcards are signed on the back. The "Thank You" is not just from me, but from all who are grateful for the personal commitment and sacrificies of the soldiers who receive these valentines. I'm thinking that anyone confined to a hospital may like to receive a fantasy world postcard. These remind me of being out on a large inland lake looking toward shore. The water sections were "ortwork" sky pieces trimmed from "Vincent's Flowers" wall quilts. 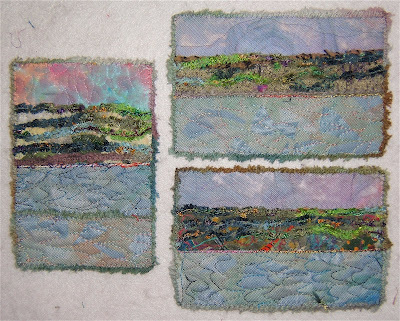 The skies for the horizontal postcards are trimmed from the background of the shoe blocks in "Imelda's Dream" quilt. I'd like to request that if you are taking part in this project and posting photos of your contributions to please leave a comment. This way it will be easy for me and anyone else to see your valentine postcards just by clicking on your name. Thanks. These two of series of postcards are obvious valentines featuring hearts. Acknowledging that some of the recipients of these cards may be sad or depressed, I used a somber dark background sprinkled with brightness. 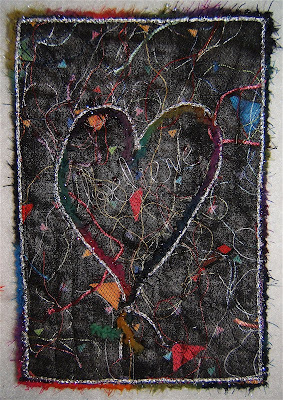 I tacked inspiring words formed with wire inside the hearts with stitches. Above is "hope". That dark ortwork background is from "Celebration" (it's the last quilt in that posting-this fabric piece is the background behind the balloons). 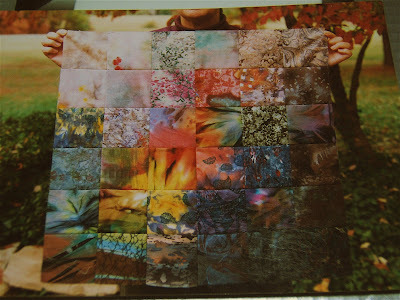 I hope there is a residual of the feeling within that quilt in these postcards. These four feature uplifting happy hearts. I hope they bring a smile and cheer to those who receive them. 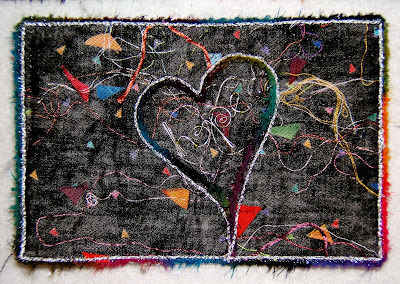 The hearts have a trapunto effect because they're cut from fabric that is already quilted. The couched yarn finishes the raw edges. I'm wishing there were more hours in a day. Only five postcards were completed today. That initial burst of enthusiasm for a project is when a lot gets done ... and I'm reluctant to do anything but. 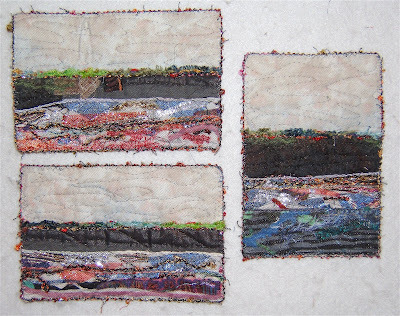 The above land/sea scape pieces are constructed from the trimmings of three projects. 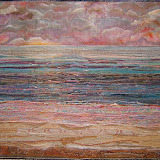 The sky parts are from the shelf foreground of one of the shoe blocks of "Imelda's Dream" quilt. I don't recognize where the others are from. 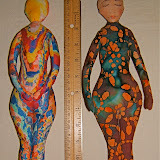 These two are purely textural. They're comprised of a leftover chenille fabric that I had created for a section of a jacket I named "Where's Elvis?" using various techniques from Judith Murrah's book, Jacket Jazz. I can't wait to get back at these tomorrow. It feels so good to be creating in the studio again. Fifteen postcard valentines have been put together from the pieces out of the drawer that is pictured in this evenings earlier post. Here are the first three finished. I had no idea this morning that my day would end with renewed enthusiasm ... that I'd be well into a major project before the day ended. YEAH! My young friends may recognize pieces from their wedding present and whoever purchased "His Music Lives" at the auction to raise funds for the Knox county school's art programs might, as well. *The photo is clickable for you to view a larger version in a separate window. Click the back arrow icon of your server to get back to this post. Since I arrived home from being up north for 3 1/2 weeks over the holidays, I've had an awful cold. A lot of time has been spent posting and surfing the web because I just haven't felt up to doing anything but just sitting ... puttering ... and sleeping. In my wanderings on the web I saw a call for postcards for wounded soldiers on Mary Ann's weblog. For a few days now the thought of making some for this cause has been niggling its way to the surface. Just today I'm feeling better and ready to "go". I pulled out this drawer full of trimmings from my "ortwork" quilts. They had been saved with the plan to someday connect them all into one big quilt. Right now I feel inspired to play with these goodies and use them as the base for a bunch of valentine postcards for this cause. For more information about this nationwide project click here. I hope you feel inspired to contribute, too. 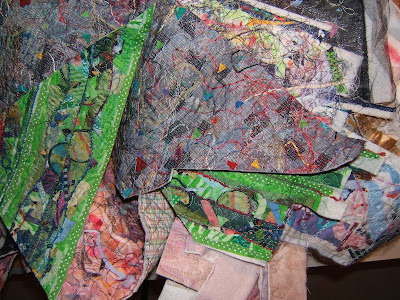 I had been given 6" blocks of fabric that were patterned with what I thought were semi-precious stones. I was just playing when I cut and sewed and then recut and resewed them together several times ala Ricky Tims "Harmonic Convergence" technique. 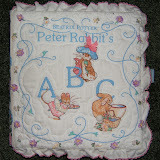 It is quilted with a neutral palette of thread colors. 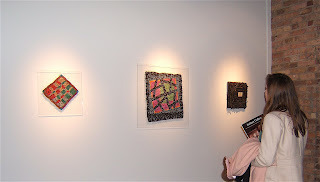 It is exhibited at MB Gallery in Chicago, Illinois. All photos are clickable for you to view a larger version in a separate window. Click the back arrow icon of your server to get back to this post. 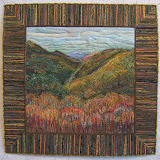 The colored fabric is a crayon transfer piece that I had purchased from the Holland Arts Council in Michigan about 10 years ago. 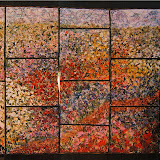 Crayon art transferred onto fabric that had been made by students was sold to raise money for community art programs. I was impressed that someone naturally chose the secondary colors from the color wheel as well as by the proportions used for each hue. Also the simple design of a block within a block within a block appealed to me. It took a while to find its place in my work. 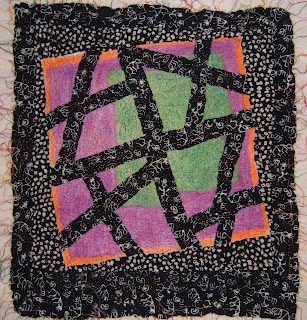 The "Tumbling Block" title for this crinkle art piece is a play on words of the name for a traditional quilt block pattern. 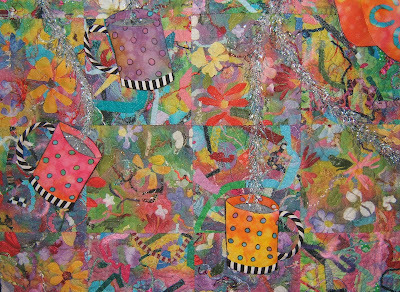 I cut the crayon transfer fabric into four irregular pieces. Each of those had two strips of black fabric printed with tumbling stick figures inserted. 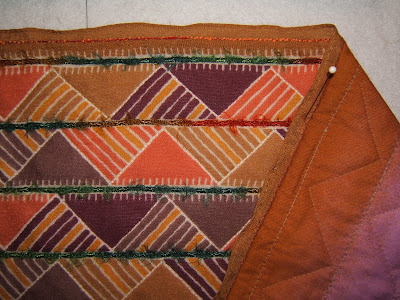 The four sections were sewn back together separated by strips of those tumbling figures. I surrounded this center piece with elongated triangles of fabric that was printed with what I interpreted as tumbling rocks. This addition set the center askew adding even more tumbling to the theme. This piece is mounted on acrylic that has spacers attached to the back so it hangs a 1/2" away from the wall, making it appear to be tumbling in space. I very much like the shadows created on the wall by the angle of the lighting of the fabric edges and and extended threads . 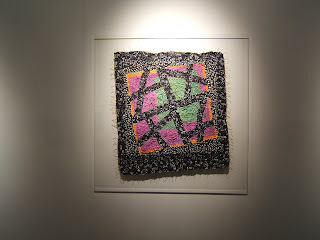 Here it is being viewed at MB Gallery in Chicago, Illinois.